A 40-year-old foetus has been found in the body of an 82-year-old woman. The Colombian woman went to hospital in Bogota suffering from abdominal pain. It was only then that doctors discovered the calcified foetus or lithopaedian inside her body. 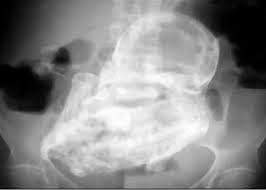 Lithopaedian, also known as stone baby, is a rare syndrome that can occur when the foetus implants outside the uterus. If the baby becomes too large to be absorbed back into the body, it undergoes a process of mummification, with barriers of calcium protecting the mother from the decaying foetus.